Following the launch of Arts Council England’s Quality Principles for work with Children and Young People, Calderdale Music Trust opted to become part of IVE’s support programme to explore how the principles could support them to embed Youth Voice into their work. That the engagement of young people with music education is improved and enhanced by enabling young people to shape the service that is available to them. Calderdale Music Trust provides opportunities for children, young people and adults to learn a musical instrument and make music together in ensembles. 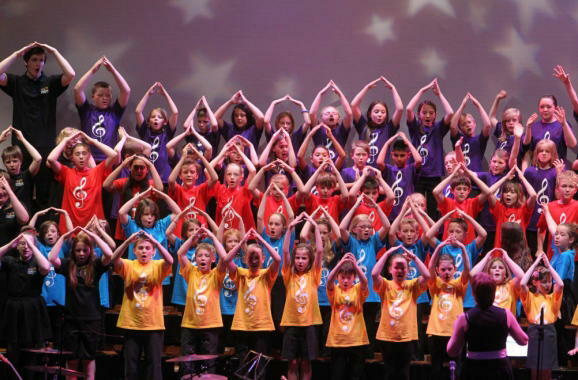 They run a variety of different ensemble projects in both central regional centres and within schools, also supporting schools through curriculum teaching and Whole Class Ensemble Tuition (WCET). Calderdale Music Trust (CMT) is also the lead organisation for the Calderdale Music Hub, a group of organisations who work together to to develop joined-up music provision, respond to local need and fulfill the hub objectives as set out by the National Plan for Music Education, first launched in 2011. In 2014, IVE launched a programme to support Yorkshire and Humber organisations to reflect on the Quality Principles and explore and experiment with how they may be embedded in their work. These sessions proved very popular and successful with the organisations who took part and, in this case study, Kevin Rivett (Director of CMT) reflects in his journey with the Quality Principles. Kevin first engaged with the ‘Getting to Grips with the Quality Principles’ programme through attending a short series of workshops held in Leeds. His initial decision to take part in the programme was influenced both by encouragement from Arts Council, but particularly after a reference to the new initiative was made at an event by IVE’s Cultural Education Director, Sarah Mumford. Kevin reflects that, for many, it was easy to see the Principles as ‘just another initiative’ but, for him, there was something deeper that resonated about the idea of the framework. During the workshops, Kevin decided that the Principle that they would focus on at CMT would be Number 5, ‘Actively Involving Children and Young People’ as a way of enriching the service provided at CMT through improving Youth Voice. He has stated ‘I felt that Youth Voice was just something we did really badly’, highlighting what may be a transferable issue between traditionally structured music services across the country. Music Services such as CMT have set ways of engaging with young people whether through school or through extra-curricular projects, but often the message about what can be gained or achieved by young people through taking part in a music project does not reach those who perhaps need to receive the benefit the most. The contention at the start of this project was to see if employing Youth Voice and responding to the articulated likes, dislikes and needs of young people would encourage more young people who may not ordinarily engage, to get involved. In order to begin the process of piloting inclusion of Youth Voice within the programme, the ‘In Tune’ project was chosen. This project is a partnership project between Music Hubs in Calderdale, Kirklees, Bradford and Wakefield, funded through Youth Music. The project worked with one Primary School in each hub area and specifically with schools who had been graded as ‘Requires Improvement’ by OFSTED. CMT decided to test out a Youth Voice led approach to this project and ran initial sessions that sought to discover what the young people would be interested in learning through the project before designing their programme. Kevin speaks specifically of a young boy who he spoke to in one of these early sessions. This was a boy who had had difficulties in school regarding behaviour and engagement in lessons. He quickly developed a rapport with this young person and found out what he was in to, what music he liked and what would make him really want to get involved in the project. Rap was the main area of interest. CMT ran with this, bringing in a practitioner who specialised in this artform. Over the course of the programme, the young person continued to enjoy the work he was doing and his behaviour improved, not just in his music sessions, but across the rest of his school life too. Kevin says ‘the school reported back that something amazing had occurred’. This initial success has now started to guide CMT’s work on a broader scale, in terms of their approach to involving young people in decision-making and the artform focus of the many projects that CMT deliver. The success of the work done on the ‘In Tune’ project has influenced other project work taking place within the Trust. A recent boys’ singing project encouraged participants to step outside of the stereotypical image of ‘choirboys’ into a project that saw three different schools performing with a live rock band and including rap in some of their songs. The young people’s performance was so powerful and well-received, according to Kevin, because the young people were ‘visibly doing something that they believed in and not just something that they had been told to do’. Music, and any arts engagement, is a process for young people that goes beyond the face value reality of the learning of the tools and supports the young person to explore their selves, their futures and the way in which they engage with the world around them. Through allowing young people to guide the work of the music service, the service itself can help to provide those tools that enable young people to grow and thrive. 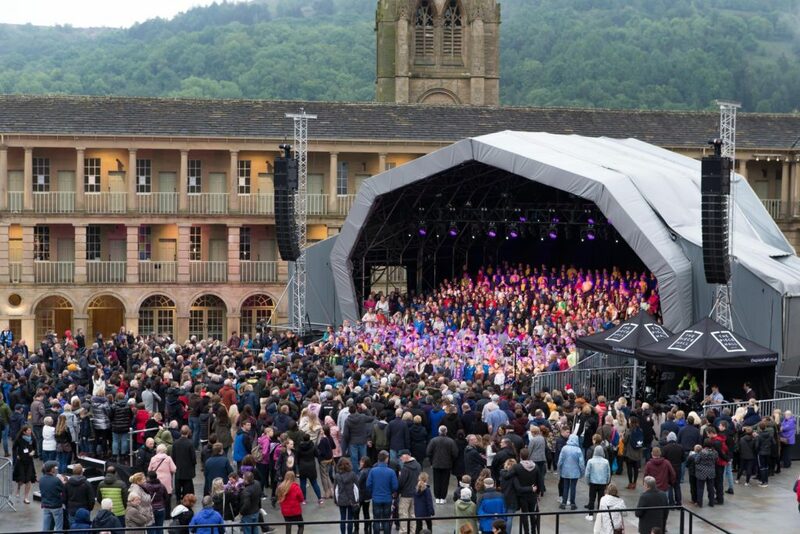 Evidence of the success of the greater involvement of Youth Voice within CMT’s programme can be seen through the award nomination that they received for 2018’s Big Sing event, held at The Piece Hall in Halifax. This project saw children from nine primary schools from across the area work with a professional musician to write brand new songs that reflected elements of the history of The Piece Hall that appealed to them. These included stories about a tightrope walker traversing the walls of the Hall and the Zoo that it once contained. This project has been nominated for an Excellence in Primary/Early Years Award at the 2019 Music Teacher Awards for Excellence, the winners of which will be announced in March 2019. Kevin has suggested that the success of this project came from the active involvement of the young people in writing the songs. 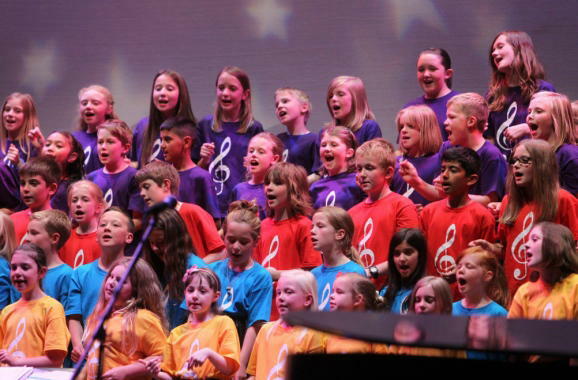 Not only are the songs themselves great artefacts of how the stories of the past can capture the imaginations of 21st Century children, but the quality of performance is enhanced by the children knowing that they are performing something that has been created by them. With all this fantastic activity happening, reflecting the new found focus on Youth Voice, it is important to take a step back and address how the engagement with the Quality Principles through the IVE programme has helped CMT get to this point. Kevin stated that the Quality Principles reflective practise sessions were invaluable in enabling professionals across the arts and culture sector to speak about and share experiences. He highlighted the importance of seeing the Quality Principles as open for discussion and unpacking by the group rather than a didactic set of static requirements to be fulfilled. He remembers leaving the sessions feeling impassioned and enthused about the possibilities that were being opened up through the process of engaging with the Quality Principles and, applauds the open and flexible facilitative approach to running the sessions, making them really valuable in terms of the time committed. Kevin’s advice for engaging with the Principles, when not sure where to start or struggling to find that point of engagement, is to see them as something that can engage the whole team; as an opportunity to unpick the language, decipher any areas of differing understanding and find projects to test approaches out in practice. This way the work can start to embed into practice through a ‘drip-feed’ approach. The next stage for this work is to embed the ethos of Youth Voice deeper into the organisation through the development of a ‘Youth Parliament’ which can serve as a mouthpiece for young people to be able to communicate with the management and board of CMT. In the future it is also a goal for a young person to graduate to sit on the Board of Trustees. CMT have continued to make use of the support available through IVE to assist with this process and have utilized the expertise of IVE’s Chris Strong to generate a framework for this that provides the formality needed to ensure the sustainability of Youth Voice, but without being so formal as to end up excluding the young people. CMT is undertaking some re-branding activity to freshen up the visuals that greet potential service users when they first encounter the organisation. This decision was inspired in part by their work with the Quality Principles and commitment to Youth Voice. They hope that a new visual identity will be more reflective of an organisation that is current and reflective of the communities with whom they work. The impact of Youth Voice has also begun to instigate changes in the services provided by CMT. This is not a rejection of the traditional, classical-led model of a Music Service, but will reflect the diversity of experience that young people bring to their music education in the 21st Century. New services will include more digital music-making, explorations of non-Western genres and a focus on encouraging music making in those that do not read notation. The engagement with the Quality Principles has impacted on the organisation and Kevin on a more philosophical level also. CMT are currently engaged in a peer to peer project with music hubs in St. Helens and Tower Hamlets who have come together to explore Arts Council England’s Creative Case for Diversity. Within this project they have begun to interrogate and dissect what diversity actually means for them as individuals and organisations, a process that Kevin has realised is one that has been heavily influenced by his experience with this work around the Quality Principles. There will, of course, be challenges in the future journey for CMT in ensuring that the momentum from this project is carried through and able to truly impact the future of the organisation. Capacity for staff members is a common issue that is reflected in many organisations and the drive to embed something strategically is often displaced by the need to ‘firefight’ and be reactive to issues or requests from external sources. The key to making this initiative work is to take the time to step back and create the methodology and framework that will allow Youth Voice to be a sustainable and vital part of Calderdale Music Trust way into the future. By employing an art specialist, Pathways E-ACT Primary Academy has demonstrated their commitment to arts education and belief in its contribution to overall attainment….